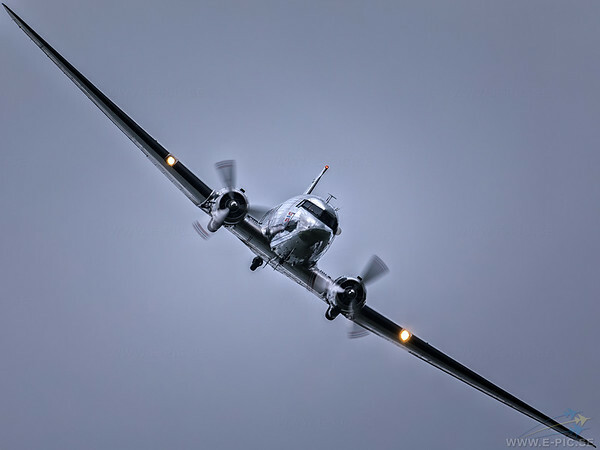 The DC-3 with c/n 11750 that the Dakota Norway Foundation owns and flies, is originally a military model called the C-53D Skytrooper. This version was built in 159 copies and delivered in the period February until July 1943 from the Douglas plant in Santa Monica, California. Dakota Norway's DC-3 is known as USAAF serial 42-68823 and was delivered to the United States Army Air Force the end of June 1943. Of the period between 1943 and 1948, little about the Dakota's history is known. In 1948 she was purchased by Finnair and flew with the airline until 1969 with registration OH-LCG. After her service with Finnair she was taken over by the Finnish Air Force, and used as the personal aircraft of President Kekonnen as DO-9. She was bought by Aces High Ltd at Chobam, Surrey in the UK and was assigned civil registration G-BLYA for just five days before she was sold to the US with registration N59NA. Apparently it never arrived in the USA as in July 1985 another Dakota (c/n 9043 with serial 42-32817) took up this registration. It seems that Thore Virik from Sandefjord and Arne Karlsen from Stokke bought this Dakota directly from the Finnish Air Force in 1985. And since August 1986, the Dakota is flown in Norway where it is registered as LN-WND. The Dakota Norway Foundation has as as purpose to maintain this piece of cultural history and to keep this flying museum airworthy. Classic plane operators are subject to the same stringent requirements for maintenance as all other operators in the aviation industry. A corps of of volunteers of the Foundation work very hard year round to let the public enjoy the intoxicating sound of the old, good Pratt & Whitney piston engines, now and in the future. The LN-WND has spent 38.600 hours in the air, this should say something about the reliability of this famous design.